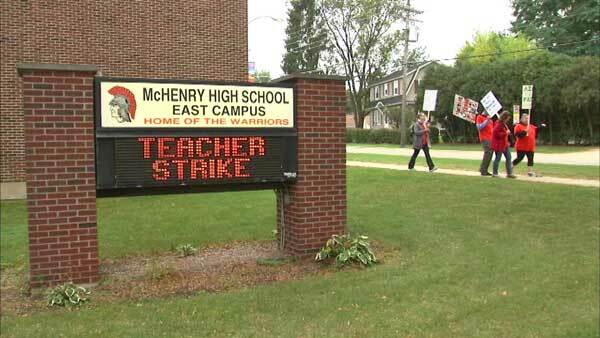 Teachers are on strike in McHenry High School District 156. MCHENRY, Ill. (WLS) -- Teachers failed to reach an agreement with District 156 in the latest round of contract negotiations. Before that session, McHenry High School was forced to forfeit its homecoming game. Contract talks ended around 1:20 a.m. Friday. There is no school on Friday at McHenry's east and west campuses. This is the seventh day more than 2,600 students have been out of the classroom. Teachers went on strike last Thursday. The key issues are pay and health insurance. This week was supposed to be homecoming week. The high school had to forfeit Friday's football game and postpone Saturday's dance until teachers reach a new deal with the district. Both sides are expected to return to the bargaining table around 7:30 p.m. Friday.